Being a gamer, there is always that one franchise that you follow. Sure, the most avid of gamers play a plethora of genres and titles over generations of consoles, but there is always that one series that, for whatever reason, you keep returning to over and over. For some, it's Call of Duty, but for many...it's Mario Kart. Starting back on the SNES back in 1992, the racing series has appeared on every Nintendo console and handheld device since, defining the genre with every iteration. 22 years after its initial launch, Mario Kart 8 makes its way onto the Wii U. Once again...Nintendo shows everyone how racing games are done. As Mario Kart 8 obviously doesn't have a story, let's talk a bit about the characters. 30 playable characters make up the roster for the latest installment of the series, which has come as a bit of a disappointment to some. With the Wii U's higher processing capabilities, there were many who were no doubt hoping that Nintendo would push the roster up somewhere closer to 40, allowing for more fan favorites. Nevertheless, the veteran racers, the ones who have been in this series since the beginning (Mario, Luigi, Bowser, DK, etc.) are all back. The biggest new addition to the roster is that of the Koopalings, the little children of Bowser. 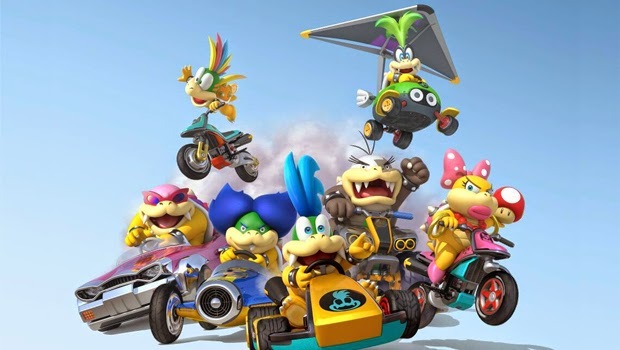 All 8 of the Koopalings are spread out among the game's three weight classes, and are most definitely some of the most exciting additions to this game in recent years. Metal Mario and Pink Gold Peach also appear in addition to Rosalina (Mario Galaxy). You can also once again play as your Mii, which has come to be an expected addition. The only true negative about the roster is the presence of the two metal characters as well as the amount of babies (this game has FIVE). While the babies do help to flesh out the light weight class, there are plenty of tiny characters in Mario's world which would have made more exciting racers. Metal Mario is understandable, though he is nothing more than a shiny version of Mario. Perhaps bumping the metal characters up to a heavy weight class would have helped make a difference instead of simply coming off as a re-skinned model. It would have been nice to see old favorites like Dry Bowser, but long time fans of the series should be used to an evolving roster. The big selling point for Mario Kart 8 is the addition of zero gravity. At certain points during the race, there will be blue spaces which appear on the track, allowing the player's kart of bike to be able to hover along that wall, almost always gaining an additional boost. Running into certain objects as well as other players during zero gravity mode also gives a boost, allowing for a different play style in this areas. When playing, there isn't really much to make zero gravity look different from when you are flat on the ground racing. 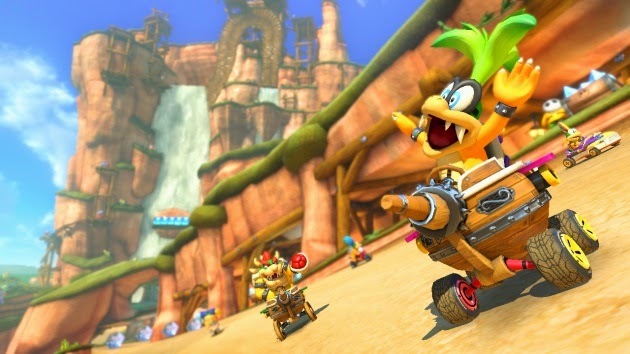 This is not a negative, however, as the new design element has allowed Nintendo to come up with its most inventive Mario Kart tracks in years. For perhaps the first time since the ever popular Mario Kart 64, every single new track is exciting and memorable. Nintendo truly knocks it out of the park in the design and look of these tracks, allowing the zero gravity to make standard size tracks take up a smaller area. It is a lot of fun to look to the side and see the other racers above or below you. The soundtracks on these new courses are also some of the best music Nintendo has given the series in years. Retro tracks also make a return to the series. What was before just an excuse to give the game more varied races has now become an absolute highlight with the addition of zero gravity. Not all of the former tracks feature the new gimmick, which is an absolute disappointment, but the ones which do take advantage of the new tool are better for it. 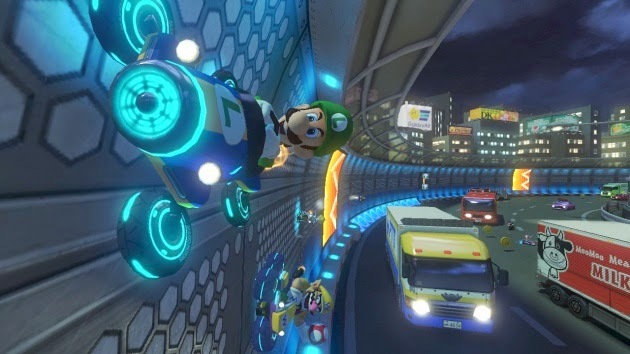 Many of the tracks have been completely re-imagined to show off what both the Wii U and Mario Kart 8 are capable of doing. N64's Rainbow Road is perhaps the best of the retro tracks as the course not only takes advantage of zero gravity, but also abandons the traditional three lap structure in favor of a longer track with three sections. These more marathon tracks are a ton of fun and Nintendo should truly consider adding more than just the two we are given here. Three new items enter the race to make your life a living hell: a boomerang flower (which can be used three times to hit an opponent), a piranha flower, and the much discussed super horn. The latter of these items is useful in crowds but also on your own as it has the destructive capabilities of wiping out the pesky blue shell. But what just may be the least discussed change to Mario Kart 8's items, is also the smallest tweak. When a character has an item, he or she now immediately pulls the item out and holds on to it until it is used. 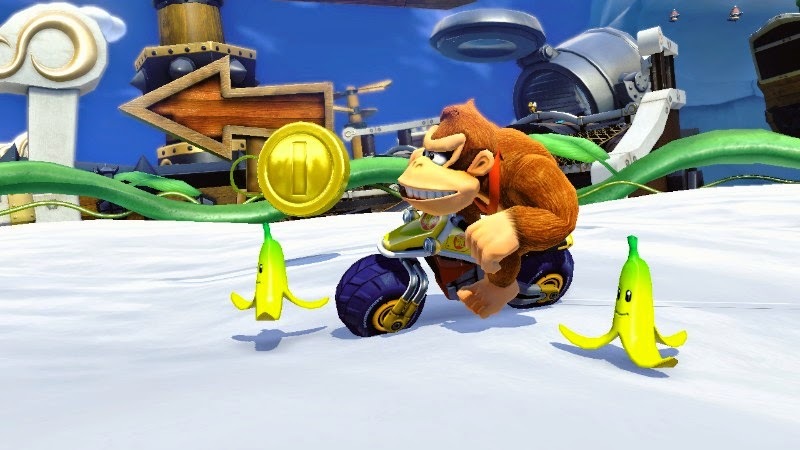 This means that racers who used to enjoy being able to have a string of three bananas behind you while picking up another item can no longer attain that next item until the bananas have been used. It is a subtle change, but it makes for much more fair racing. In addition to the usual single player and multiplayer experiences in Grand Prix and Battle Mode, Mario Kart 8 also offers online play for up to two players. Mario Kart Wii had excellent online play, but Mario Kart 8 perfects it. Races now always have 12 players, even if only a handful of humans are actually playing. Points given out after the race are much smaller in amount than Mario Kart 8, helping newer players to not feel overwhelmed by the veteran racers, but also helping you to not feel like you are being severely punished for losing one race. Voting for the next track has been reduced to three options, making it more likely your chosen track is the one you race. Tournaments are also offered and can be created by any player, which will surely help to expand how Mario Kart 8 is enjoyed over the next few years. Mario Kart TV is also a new addition that allows you to upload a highlight reel of your best race to YouTube directly from the Wii U Gamepad. As mentioned, zero gravity has allowed Nintendo to be able to be much more creative in their track design, but that is only half of the equation...the graphics also help to make these new tracks utterly unforgettable. Mario Kart 8 is a gorgeous game. Using the HD capabilities of the Wii U as well as running at 60 fps during single player, this game is one that you will enjoy staring at just as much as you enjoy playing. The lighting is superb. DK's individual hairs are noticeable, and the way the sun hits Bowser's or the Koopalings' shells is a small detail that helps make the experience all the more enjoyable. Being covered with ink is also another excuse to just show off how beautiful this game is, with the track and players around you reflecting from the ink over your character. Snow, mud, and sand also show up on the tires, only helping to add to the incredible detail. But it's not just about the lighting and what's on the tires..these tracks are incredibly rendered. Nintendo has spared no expense in making this the most detailed offering in the Mario Kart franchise to date. Small considerations such as spectators and banners for various characters' racing companies help to make this world feel fleshed out in a way we have never seen before. What makes this attention to detail all the more stunning is the way Nintendo has rendered the retro tracks. These old courses are just as meticulously detailed as the new offerings. Wii's Moo Moo Meadows is a standout of this detail, showing just how much time, care, and effort went into making this game great. Retro tracks are so heavily detailed now that the addition of the courses feels like less of an obligation for Nintendo and more of an integral part of the Mario Kart experience. Move over, Mario Kart 64, there's a new king in town. 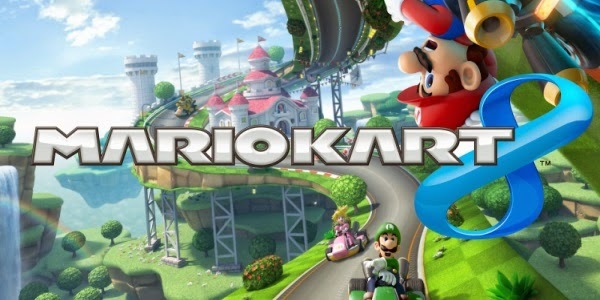 The Mario Kart franchise has always been a fun staple for friends and family with every Nintendo console, but Mario Kart 8 seeks to show you that this game can be so much more. With new gameplay additions and stunning graphics, Mario Kart 8 rises above its predecessors. Many have doubted Nintendo over the past two years, some even completely writing off the Wii U has being as far as a generation behind Sony and Microsoft's current offerings. This may be the case, but Nintendo is not giving up just yet. For those who are going to be loyal to the brand and be willing to be a bit patient, the rewards Nintendo can bring are amazing. While there may be a few complaints to be made about certain mechanics and design choices, none of those are enough to detract from what is obviously a fantastic video game. If you have been on the fence about purchasing a Wii U, you may want to start setting some money aside now. Mario Kart 8 is superb and easily the greatest Mario Kart game ever.